It's time to lighten up. I don't mean go crazy and have your dessert before your dinner - not THAT radical - but perhaps "ebony" isn't the only option for your wood floors or furniture anymore. Designers all over the planet are skipping the dark stain colors and leaving wood surfaces alone to flaunt their natural beauty, and I'm one of them! I can't speak highly enough about how low-maintenance, and high-style natural wood tones are in today's housing scene. The less yellow and the more "truly neutral", the better. They're a fast way to brighten up a space effortlessly, invite the sunlight in, and create easy and beautiful pairings with dark metals. Light woods hide dings, dirt and dust better than stained dark woods, and also open the doors to just about any paint color your heart desires for built-in woodwork; that is, unless you want to use a natural wood colors for your millwork as well, which I almost always support. For all home types and styles, dark floors and furniture can still be beautiful and even preferred. Especially if you're more into a "warm and cozy" ambiance than the "light and fresh" atmosphere that Millennials are reaching to for spacial inspiration these days. For more info on how your surroundings affect your daily life, check out House Thinking: A Room-by-Room Look at How We Live by Winifred Gallagher. For the record, this is not a sponsored blog post, I just love that book and have very strong feelings about space and its influence on our lives. For proof of THAT, check out the Design Philosophy on my website. If you're not quite convinced, and need to see some more ~enlightening~ inspiration of light wood tones being used in residential settings, pop over to my instagram feed and see for yourself how this new trend is one to embrace. Natural = Beautiful. Be sure to subscribe to the blog for updates on my latest postings and promotions. Modern Farmhouse: Trendy or Classy? Yesterday, someone asked me "How do you feel about that modern farmhouse design style? You know, the kind that Joanna Gaines applies to all of her projects on Fixer Upper?" My response was not lacking in length. With any trend, there's always a "right way" and a "not recommended" way to go about updating your own home. For my clients here in Des Moines, Iowa, I definitely think there's still a place for Modern Farmhouse design and that it's not on its way "out" just yet. In the Midwest, we admittedly see trends move through our community on a heavily delayed timeline and at a slower pace than the coasts do. With so many rural neighborhoods, and a cornfield being no more than 15 minutes away at any given moment, Modern Farmhouse is a look that's bound to stick around for a while. My feelings on "MF" are based on 2 big factors: 1) It's actually practical. People want a clean look, but in a cozy environment that FEELS like "home". Modern Farmhouse is practically the definition of that "home" feeling for the average Midwesterner. And 2) High contrast and high texture have always been highly regarded in the design community. Modern farmhouse design capitalizes on those principles and gives them a fun, stylistic flair. So go ahead - paint your walls AND trim white, install a natural or dark stained wood floor, splurge for the farmhouse sink, order black framed windows and go for those black or even gold cabinet pulls in your kitchen! After all, it does look darn good. I do feel it's important to mention specific aspects of the Modern Farmhouse movement that I do NOT think will be sticking around, since some of the more specific motifs may very well become a bit regrettable. Reclaimed Wood Everywhere. It has a place, and "everywhere" is not that place. Use sparingly for a big impact. Sliding Barn Doors. These are purely decorative and serve very little purpose; they're inconvenient to operate, they take up a lot of wall space, and they don't provide sound, light, or lockable privacy like any other door would. Passing fad. Shiplap. Again, use this sparingly. If you put it all over every wall in your living room or kitchen, you'll likely soon regret it just like a bad wallpaper. Sorry Joanna! Taxidermy. Real or faux, animal heads, horns and antlers are a trend that is already on its way out, so try not to get too attached to layering a "hunting" theme into your modern farmhouse. If you have any specific questions about this topic or others, please feel free to reach out, or schedule a consultation so we can chat about it! Also, join my brand new Facebook group Studio Leu to ask your questions and see my responses to others! Oh my goodness, it's February already! I cannot believe how fast time flies when you’re running a business. Each week feels like just one short day. So here’s to making the most of every one! In today’s blog post, we're diving into the trends we're about to see becoming HUGE in the world of residential interior design. I’ll also be adding my professional opinions in, so you can get some wonderfully biased (but experienced) input on each trend! Last year, white kitchen cabinets became almost a rule. If you were updating any room with cabinets, no matter your style, white was the way to go. This year, you’re going to start to see a growing number of kitchen and bath cabinets (new and old) painted deep, dark colors – mostly shades of green and blue. Over the winter, several homeowners tried colors like pink, mint green, and baby blue. And those will stay! So will white, as it’s a classic, but deeper colors will be entering the scene paired with lighter colored knobs and pulls. Along with this trend will be stark white walls and trim, serving as a blank canvas for whatever décor and/or accessories your heart desires to be the focal point! My thoughts: These deep colors look absolutely gorgeous in magazines and in model kitchens online. However, unless you love to clean or you hire a regular cleaning service to help you out, I’m a bit concerned about the tops of drawers and doors showing dust. Plus, I’m not entirely confident this trend will hang around long enough to make the investment worthwhile. For now, I’m sticking to lighter colored cabinets to help brighten the space, rather than add drama. With hosting trends and "open concept" layouts surging in popularity, many homeowners have started to combine their kitchens and dining rooms. This makes meal preparation less of a back-of-house activity and instead, part of the night! Placing your kitchen table right in the center of the kitchen not only encourages gathering in the space, but also forces you to keep the dining table cleared off to use as a work surface for meal preparation. This one is definitely less of an aesthetic trend and more of a functionality trend, but it's a design trend nonetheless. My thoughts: I love this! If you’ve got the space to work with, this is perfectly acceptable – most people say they don’t use their dining rooms anyway! This trend isn’t so much “new” as it is “back” because people have realized they like to spend time together, especially when cooking. If you have an island with seating, you know how convenient is is for one or two people to be able to sit there and chat with you while you cook. Image if your kid could be doing his or her homework at the kitchen table while you prep meals for the week, or if your entire friend group could be gathered around the kitchen table prepping dinner with you, right in the kitchen. Those of us who remember the late 80's and early 90's also remember brass or gold hardware becoming the best thing and quickly fading to the worst thing over the course of about 7-10 years. However, I'm here to let you know that if you haven't upgraded your brass to brushed nickel or oil-rubbed bronze yet, DON'T! Brass is back in big ways. To be fair, it came back circa 2015, but it's making its way to Iowa NOW. It's more affectionately referred to as "gold" these days, but they're usually the exact. same. thing. Brass is now being masterfully paired with the always-lovely white cabinets AND those deep, dark colors we talked about to add an exciting touch of bling to kitchens everywhere. And bonus: it's incredibly easy to add accessories to match! For instance, gold-legged bar stools, or even gold silverware if you're really getting into the spirit. Gold and white are also the perfect back-drop for greenery - the 2017 Pantone Color of the Year, and a vague word that refers to all things plants. For more, check out this article on the brass comeback! My thoughts: I love it! As long as your cabinets are painted and not stained, gold seems to go with every top cabinet color on the market right now. White, black, blue, green, blush, you name it. I say go for it! Worst case scenario, you switch them out in a few years or spray paint them to match the next trending color. But I think this one is a pretty safe option for now. Remember last year when your trendiest friend bought and decorated a bar cart, then put it all over their Instagram? Well, it caught on. This year, expect to see more bar carts (lots of gold and black) on your social media accounts. They're wildly fun to accessorize and adorn with flowers, glasses, ice buckets, olives, fruit slices and your beverages of choice. My thoughts: I think bar carts are incredibly fun and a great way to fill a void in a room. However, they're not for everyone, and that's okay! If you've got kids, or you rarely host, or you don't already have a liquor stash, I don't recommend going out of your way to make this look a reality in your home. Form and function are equally important in a well-designed space, so don't ever sacrifice one for the other. In 2016, we saw subway tiled walls, black/bronze pluming fixtures and hexagon floor tiles in every top-of-the-trend bathroom. This year, we're inviting cement tiles into the picture! The tiles are actually made of cement, and their top layer has been dyed in a beautiful pattern, of which there are many options. The top layer that shows the design is often over 1/4" thick, which means a chip in the tile should only reveal more of the same color, making imperfections much less noticeable. My thoughts: Honestly, it's too soon to tell. I even talked to a tile expert and they weren't sure either. 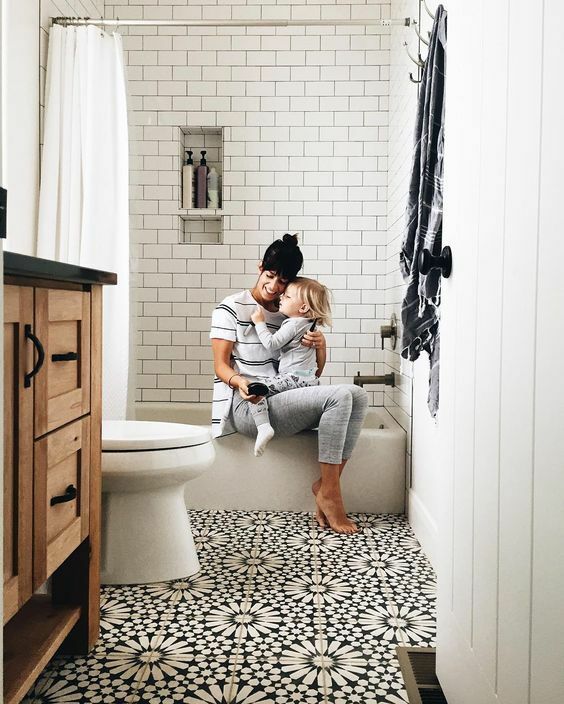 Tile is such a long-term investment that it's hard to know how well it will hold up over time without spending the time. With trial and error, we've learned that ceramic and porcelain tiles are decently durable but any chips in the finished surface are very visible. We also know that marble wares down faster than other options because it's a relatively soft stone for heavy foot traffic. With cement, we know it's a strong material but the larger the surface, the more likely it is to crack. But will cement tile crack, or is it small enough to avoid that problem? Is it easy to keep clean or does it look dirty overtime no matter what? Does it ware down like marble? How well does grout hold it? Those who are brave and trying the cement tile look absolutely LOVE it. And though only time will tell with tile, for now, I'm in! Mudcloth pillows are great and all the rage right now. But coming next: watercolor pillows! They're made with love, by hand, and give any space the perfect touch of artsy expression. One of my favorite things is to support local businesses. So please check out the Etsy shop of Jenna Brownlee Design (based in Clive!) and see beautiful examples of home decor made with watercolors! These soft yet vibrant colors are just what we'll want more of this spring as the weather warms and the sun shines bright! My thoughts: Well, first of all, the basket in the above picture is one of my all-time favorites. West Elm does not disappoint. But with regards to the watercolor pillow trend... obviously, I'm in love! Never come between me and a handmade throw pillow! !